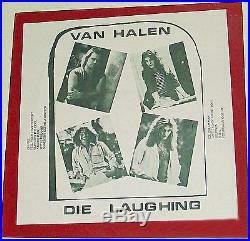 VAN HALEN DIE LAUGHING 1st PRESSING 1977 Bootleg Live MINT MINUS Empire V-77 M- VG++ Album LP Record Vinyl 33-1/3 VINTAGE original 1st pressing FIRST EDITION 1st rareandunlimited. 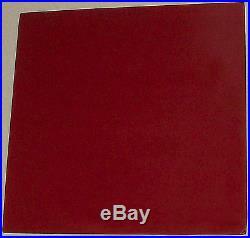 You are purchasing a VINTAGE LP – VAN HALEN – DIE LAUGHING – FIRST PRESSING!!!! This includes all the originally issued items – sleeve, jacket, vinyl, etc. SUPER RARE and getting extremely hard to find this pressing!! I have one more copy left and that’s it. This IS NOT a repress or a reissue this is the original boot!! EXTREMELY RARE – Only 100 of these were pressed!!! The Red cover is the original color of the 1st issue of this. PLEASE LET ME KNOW IF YOU HAVE ANY QUESTIONS REGARDING THIS ITEM. PLEASE LET ME KNOW IF YOU NEED ADDITIONAL PICTURES. Collector of records for over 35 years. I use conservative grading – Goldmine standard. I have attempted to grade the condition of the these (Mint, Near Mint, Very Good Plus, Very Good, Very Good Minus, Good/Fair, Poor) to the best of my knowledge. All records have been stored vertically in poly jackets, in humidity controlled, smoke free environment. The grade that each record receives is my opinion, which may vary from yours. Please ask me any questions first before purchasing if you need more details or description. Be assured your item will arrive in the condition advertised!! Get the personal customer service big box business can not give! Cover is Mint Minus front and back with slight dog ear bottom right and top left, moderate dog ear bottom left. Album is VG++ both sides with light sleeve scuffs, nice and glossy still. Civic Auditorium – Pasadena, CA – October 15, 1977. Center trail is marked V-77. Songs Include: On Fire, Feel Your Love Tonight, Run With The Devil, Atomic Punk, Little Dreamer, Somebody Get Me A Doctor, Ice Cream Man, Ain’t Talkin’ About Love, Eruption, D. A, You Really Got Me. We pack very securely, so be assured your item will arrive safely. All emails will be answered within 24 hours of when they were sent. Only unopened items in brand new condition will be accepted for return. The item “VAN HALEN DIE LAUGHING 1977 1st Pressing Record LP Vinyl Bootleg Live Empire I” is in sale since Wednesday, February 08, 2017. This item is in the category “Music\Records”. The seller is “splendorifia” and is located in Hudsonville, Michigan. This item can be shipped worldwide.